Oh dear - less than two weeks after abandoning my Windows phone in favour of an iPhone, I am back using it again. Last night I left my iPhone on a charger overnight but this morning discovered that a crack in the glass appeared. This is the first time that I have broken a smartphone like this, but I am convinced this happened without any contribution from me. I plugged it in to charge, and then there was a crack. 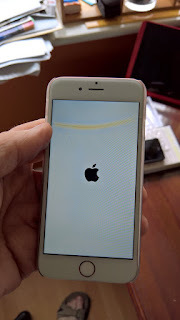 I did not drop it - the crack is a clean single line near the top of the screen, which also leaves a shadow on the screen behind the glass. Did it spontaneously crack while charging? The touch screen in the small space above the crack is still working, but below it there is no response. The screen will have to be replaced. However, I'm wondering if it is worth it as the cracked screen is already a replacement screen. It will cost around €100 to fix, with no guarantee that it will last - I think the Windows phone has suddenly become attractive again! Right now there are four old iPhones in my house - including the cracked one to the right. Two are glass-cracked iPhone 6 models, with two old iPhone 5 models. I shudder to think what we have spent on these over the past 2 or 3 years just to create another Apple graveyard of devices - I'm guessing my house is not that different from many others. While Apple laugh all the way to the bank, I am still astonished that glass is still being used in smartphones - there must be an alternative. Millions must be being spent on replacement screens all over the world. So it is back to fewer Apps and a Google-less Windows phone. Outlook, Edge, and Bing Maps are my new best friends again!